Developers St. John Properties, Somerset Construction and Elm Street Development are building Middle River’s ‘Greenleigh at Crossroads’. This new community will be bringing thousands of new jobs, new homes and businesses as Baltimore County Maryland embraces the re-development of Middle River, Maryland. 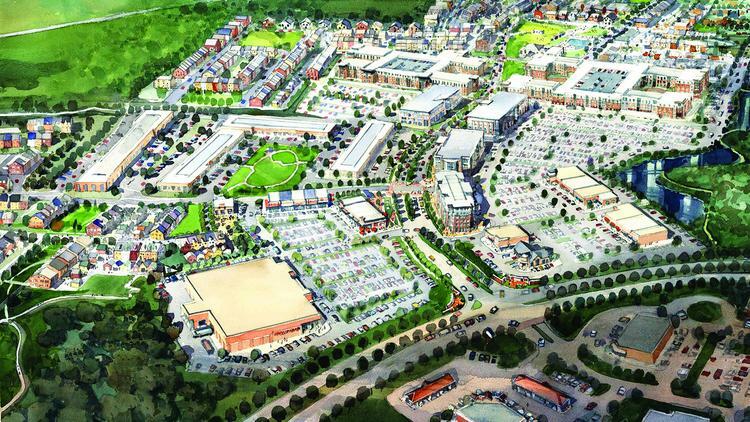 This is an estimated $750 million mixed-use project on a 200 acre parcel along Maryland Route 43. The project incorporates urban design elements where you can walk to work, shop or play. This mixed use development will include a mix of offices, retail shops, apartments and homes. This new community will also include open space for more walking and less driving. Approximately 1500 new homes including single family, townhomes, luxury apartments and condominiums (models expecting to be open in Spring of 2017). Approximately 428,000 square feet of office space comprising of 3 mid-rise office buildings and 4 single story office buildings (already complete). Approximately 128,000 square feet of new retail space. A Marriott SpringHill Suites with a 120 rooms. “Greenleigh will be a tremendous addition to all that White Marsh and Middle River has to offer. It will be a great live-work-play community and I’m excited to move it forward,” said Councilwoman Cathy Bevins. “We thoughtfully and carefully designed this new live-work-play community to create a 24-hour environment. It includes best-in-class offices and retail that satisfy the day-to-day needs of business people and residents,” said Ed St. John, Chairman of St. John Properties.